Pokemon Bank Is Exciting. Here's Why. 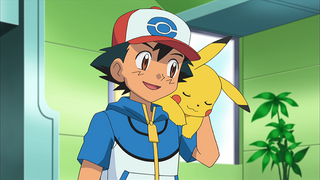 At first glance, having the ability to store Pokemon in the cloud doesn't seem like a big deal. It's just storage, you know? A place to put Pokemon in. Uh, okay. Neat for the collectors and obsessive Pokemon breeders, sure, but what does it mean for everyone else? Thing is—and mind, some of this is speculation—something as small as Pokemon Bank, the recently-revealed 3DS app for storing Pokemon, can have a lot of implications. Let's start with the most obvious one: you don't have to worry about losing or corrupting older carts anymore. Heck, you don't even have to worry about keeping old carts with you at all if you put your favorite Pokemon in the cloud. I'm not the only one that has way too many Pokemon carts, right? Now I don't need to always keep them around to have access to my Pokemon, or to transfer Pokemon between games thanks to Poke Transporter—an app that will launch with Pokemon bank. Eat your heart out, cheaters. You can't just have a box of thousands of shiny level one legendaries! Now, one of the long-standing difficulties about transferring Pokemon is that the early games aren't as accessible anymore. EDIT: I originally stated that you can't transfer from first gen, completely forgetting about the GBA remakes. My bad. We can transfer Pokemon from the second gen Game Boy Color games thanks to Pokemon HeartGold and Soul Silver, but Pokemon Ruby and Sapphire are a bit more difficult because they're Game Boy Advance games. Sure, you could find an older DS and move those Pokemon up the hard way, but that's kind of a hassle, isn't it? Especially since the 3DS doesn't have a GBA slot. What if, technologicalbrian poses, Nintendo released the older games on the 3DS's eShop? Kind of unlikely, I think, but geez. I'm sure they'd sell well if Nintendo actually went for it, and it would certainly make transferring between older games even easier. You could just use the same system, sans carts or much hassle to perform the transfers. Things get even more interesting if we look beyond the major handheld games. Imagine how cool it would be if you could transfer Pokemon between, say, the new Mystery Dungeon and X & Y? That's the sort of possibility that having access to a storage detached from any game in particular opens up. And while we haven't had a console Pokemon game in a long while, there are rumors of a new one popping up. We know that the 3DS and Wii U can interface in some way, given that the upcoming Smash Bros game will let players transfer characters they've customized between the Wii U and 3DS versions. It would be pretty swell if we could transfer Pokemon from a hypothetical Wii U game into the 3DS's Pokemon Bank, or vice-versa (or if there was any sort of communication between the handheld games and the console games, really). Whether or not Nintendo will do a lot of this, we don't know—it's speculation, yes, but it's all stuff that Pokemon Bank opens the doors for. But also...the things I've mentioned so far? Most of it is stuff that either things we've been able to do before in some form (remember Pokemon Box or Pokemon Ranch? ), or is simply the streamlining/updating of some older process. The interesting fascinating thing happened when Ishihara humblebragged about meeting with Shoko Nakagawa, a 28-year-old Japanese idol/actress who enjoys the Pokémon series a great deal. "At the end of the interview, [Nakagawa] told me that she wished I would create something like Pokémon Bank. She wanted her Pokémon that she trained to be securely stored and passed down to her kids and grandkids. I had to watch that part of the video again a couple times. I’ve long considered Pokémon to be something I’ll play for as long as they put out games, but here’s someone who wants to hand down Pokémon for generations to come. Until Ishihara shared that anecdote, I had no idea that that was something I wanted to do. Allow me to remove some context to better allow a look at how amazing this is: we’ve created memories so strong with a piece of digital information that we want to show these memories to our descendants. I don't know about you, but man. Thinking about handing down an old friend to a kid is pretty effin' beautiful.